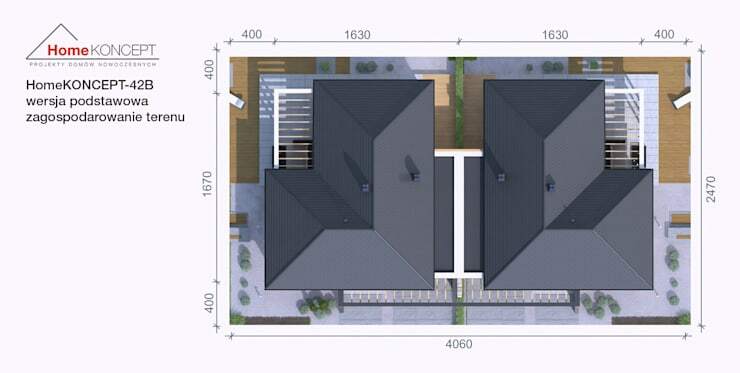 They say two heads are better than one – so what about two houses? Today’s homify 360° doubles the style by taking a look at two mirror-image homes right next to each other on the same plot of land. Architectural firm Homekoncept from Kraków, Poland, is in charge of this double delight – let’s take a look! A lot of people, upon hearing about this unique concept where two mirror-image homes share the same plot of land, might expect a weird-looking façade – and yet, that is not what this structure (or these structures, rather) provide. In fact, the façade is quite modern and stylish, with all the right materials (stone, concrete, brick, glass, wood) and neutral colours to make these homes fit perfectly into a peaceful suburban neighbourhood. It would seem that space was not an issue for this project, as both houses enjoy rather spacious back yards, complete with shaded patios, timber decks and pristinely maintained garden trimmings to enhance the visual detail of the exteriors. This aerial view of the houses provide us a picture-perfect vision of how the houses mirror each other in layout – what happens on the one side is perfectly repeated on the other, down to the finest detail like the garden shrubs and plants. Of course, in real life, the project won’t be as identical as in these images – a certain sense of uniqueness and private style goes a long way, after all. 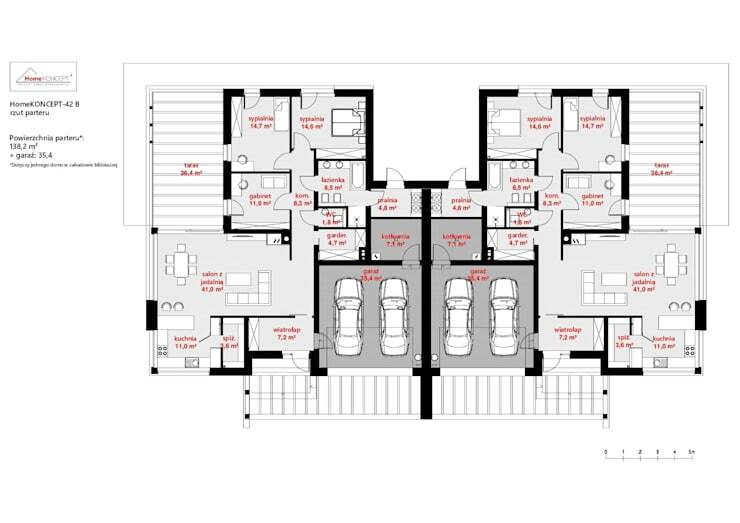 We don’t have any images of the interiors, but we do have the floor plan to inform us about the homes’ interior layout. 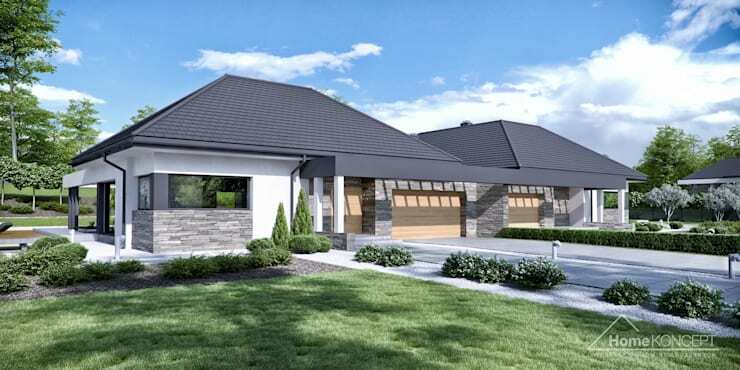 As we can see, each house provides a two-car garage; a spacious open-plan layout which includes a kitchen, dining area and living room; a study; two bedrooms and one bathroom – the perfect little starter houses for young couples and/or families! Seeking fresh inspiration for your outdoor spaces? See these 9 ideas for small, cheap and low maintenance gardens. 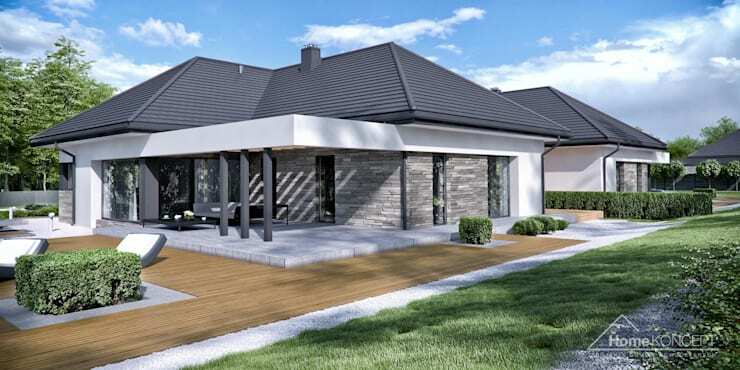 Would you consider a two-home design such as this?